Your spouse has had a difficult day, maybe even week or month. You realize they need your help and support. One important way to do this is for them to talk about it and for you to listen. But what if we planned something so unexpected it took their thoughts from the present to a faraway place – like the rainbow’s end? What if this simple act so delighted their heart that what was troubling them no longer held weight in their conscious mind? 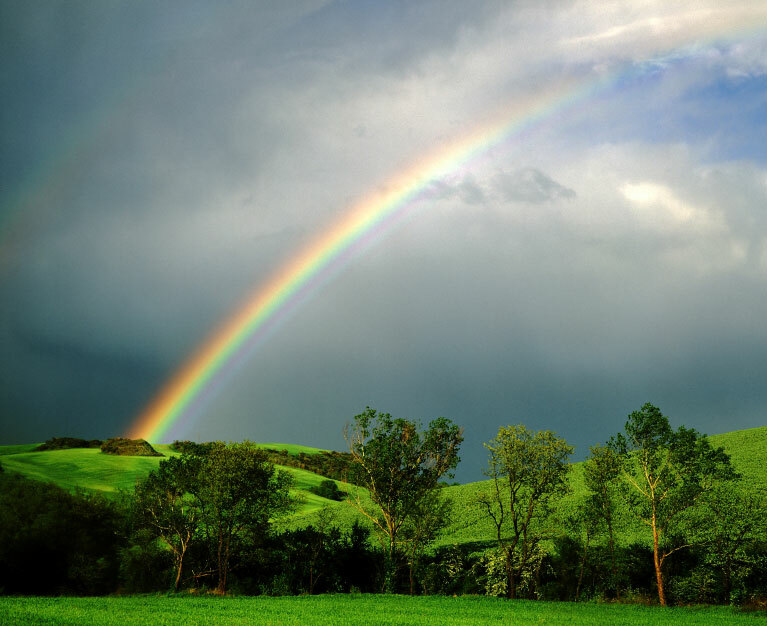 Send your spouse an invitation, e-mail or text that says: Tonight I will take you “Somewhere Over The Rainbow.” Then, send them this You Tube recording of the song by the same name, sung by Eva Cassidy. It is one of the best versions of this song we’ve ever heard – it’s sure to begin soothing their mind. Red: roses, paper hearts, wine, strawberry daiquiris, apples, salsa, red velvet cake, watermelon, strawberries, etc. Orange: oranges, orange juice, sweet potatoes, pumpkins, basketball, carrots, mums, cantalope, etc. Yellow: bananas, lemons, daisies, sunflowers, sunshine, butterscotch candies, etc. Green: grass, ivy, veggies, grapes, honeydew, money, artichokes, etc. Blue: sky, music styles: the blues, bluegrass, bleu cheese, Movies: The Blue Lagoon, The Blues Brothers, etc. At least one item from each color on the list above. Yarn or ribbon in each of the colors. Finally, have the Lucky Charms box handy for them to open. They will be surprised to find not the typical “Lucky Charms,” but enclosed is charming lingerie sure to make any spouse “Lucky!” This will work whether it’s the husband or wife who plans the date. Of course, you can use any of these ideas in full or in part to make a memorable Rainbow’s End date night. 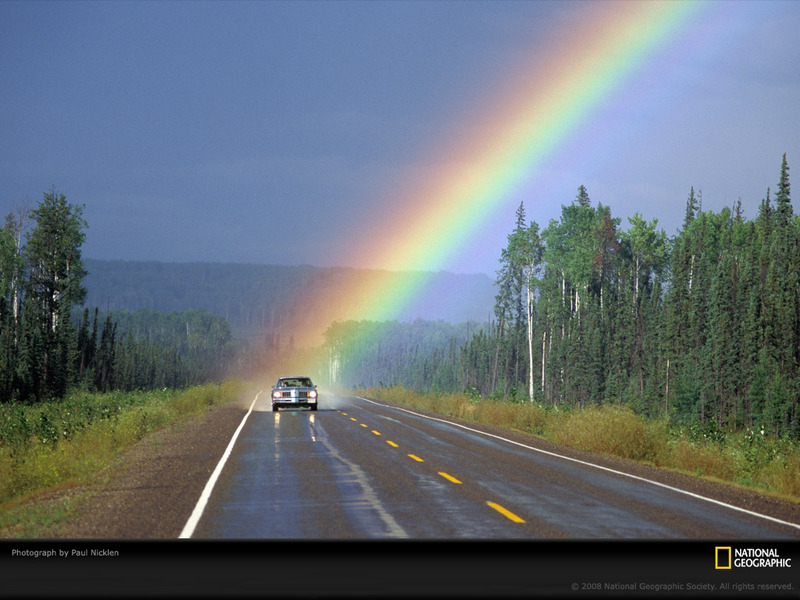 Just be sure to have fun wherever your rainbow ends. What do you think? Does this sound like a fun date night surprise? How would you make it even better? This entry was posted in Creative Dates, D.R.A.B., Date Night Ideas, Dating Your Spouse, Difficulty, Fun Dates, Growing Strong Marriages, Romance, Romance in Marriage, Romantic Ideas, Unique Dates and tagged Color, Over the Rainbow, Popsicle, pot of gold, Rainbow's End, Roy G. Biv, Somewhere Over The Rainbow, Yarn. Bookmark the permalink. Wow, Debi. This is quite the stay-at-home date night idea. Thanks for the ideas. I did something like this last week. It wasn’t really a date night but we were able to spend about 2 hours alone. Our son has spent most of his summer working at our church camp in the mountains near Sandpoint, Idaho. My husband has been pretty stressed lately with work. 14 years ago we moved from the mountains of Northern Washington to flat wheat farms of Eastern WA (about 2 hours south of the mts). We love the mountains and miss them very much although we love our little town here. Anyway, last week our son had to be picked up mid week because he was going on a trip with a friend. I called my husband and told him I had a surprise for him. Picked him up from work, ate a cheap dinner at McD’s and drove to the mountains but it was so worth it when he just kept saying thank you! A drive to the mountains was just what he needed! And the private conversation time is always so nice. HAHA!! I am such a dork!! If I had read the WHOLE post, well my date night was niothing like this 🙂 This is what I get for only reading part way!! Anyway! Oh Debi, funny! I LOVE the ocean!! But it is at least 6 hours away!! That sounds wonderful. If you and your hubby are ever in Florida let us know. W love to meet our Vineyard friends whenever we can. What a great idea for a date night! Thanks for the inspiration! Thanks – we’re glad you like it. and, since it’s a lot of work- you get to prove that you really care, too! Thank you, Roy! I appreciate you comment and more than this you help today! I have had several attempts at date nights over the years…..1st time he got another load in the truck so didn’t make it home…..2nd time he went to the pub with mates……3rd time he was in late…..didn’t notice anything, ate tea, had a shower and went to bed…..4th time…..when I rang he just groaned and said he couldn’t be bothered doing anything tonight……not sure I really want to put myself out there again…..It sounds such a wonderful thing though….. Date nights can seem awkward when they haven’t been done for years. Maybe you should begin with doing special, out of the ordinary things for him – just because. I understand your struggle and you not wanting to set your self up for another disappointment. Maybe your husband would respond to your encouragement in all the things he does right. All marriages are different and what works for one couple may or may not work for another. The important thing is to find what works for you. I hope this helps and you are encouraged. We appreciate your comment! Kat, I was worried that my H wouldn’t be into the date night thing so I didn’t plan any dates at first, instead I spent a few months surprising him in the intimacy department. I also found out his love language and after 20 years of marriage began to consciously love him in the way he felt it best. By the time I broached date nights, he was completely into ME again and therefore completely ready to participate. It may not work for you but I wanted to share what worked for me. If I had not laid the ground work I think my results would have been like yours. Best of luck! That would be nice! We’d love that! We keep talking about going to Winter Park to see my husbands cousin and his wife. His cousin runs a deep sea fishing outfit. Has for many years.